Mindwalks provides gentle and useful guidance to people in need of physical, spiritual and/or emotional resuscitation. It invites the reader to explore the vast healing and revitalizing properties that can be discovered through the “art” of walking, and is a comprehensive, nondenominational tool to assist the average seeker on maintaining inner balance. If one is experiencing difficulties “managing” life’s problems and in need of creative and inexpensive ways to reduce “stress,” find solace and/or simply gain balance, Frakes insists in Mindwalks can help. Designed and crafted from personal experiences, Mindwalks provides readers with step-by-step instructions on how to incorporate daily walks and meditation into their life. 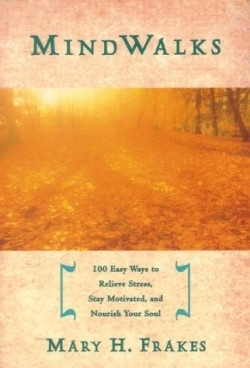 For example, the chapter on “Nourishing Your Spirit” devotes thirteen short sections to guiding the reader on how to creatively convert the physical benefits gained from walking as a catalyst to exploring more indepth spiritural benefits. Each section is threaded with Frakes? “tried-and-true” successes and failures; including her initial reluctance to use walking as a springboard for gaining a deeper insight to more inner spiritual and emotional concerns. Frakes invites the reader to explore what it means to live ones? life “whole” or in wholeness. Being whole eventually means having to address personal issues that we may not be proud of, and must examine if we are committed to our personal healing. According to Franks, walking and meditating on “being and living whole” provides the gateway into “being” in harmony with nature. The Additional Resources and the Walking Techniques and Tips sections complete Frakes? pocket treasury of creative walking remedies.